Miscarriage is a stressful event for couples and finding the cause is critical for closure and also future reproductive planning. Gains and losses of genetic material in the miscarriage are one of the possible causes of miscarriage and can be detected by traditional chromosome analysis or more detailed chromosome microarray analysis for identifying tiny chromosomal losses and gains collectively known as copy number variants (CNVs). CNVs have been shown to be strongly associated with developmental abnormalities in children but their role in miscarriage is largely unexplored. Fig. 1. Comparison of the CNV characteristics in 101 miscarriages from 4 studies. Our study aimed to find the role of these CNVs in early miscarriages that occur before the end of second-trimester of pregnancy. We compiled all reported miscarriage CNVs together with those found in our lab, and carried out a comprehensive analysis of their size, gene content, gene functions, and involvement in biological pathways. Our analysis included 24 CNVs that were unique to the miscarriages and not found in the general healthy population (we called them ‘rare CNVs’), and 372 CNVs that were also found in the healthy population (we called them ‘common CNVs’). Interestingly, we found that rare CNVs had a much higher gene density (56 genes per mega-base of the CNV length) compared to the common CNVs (24 genes per mega-base of the CNV length), despite their comparable average sizes. 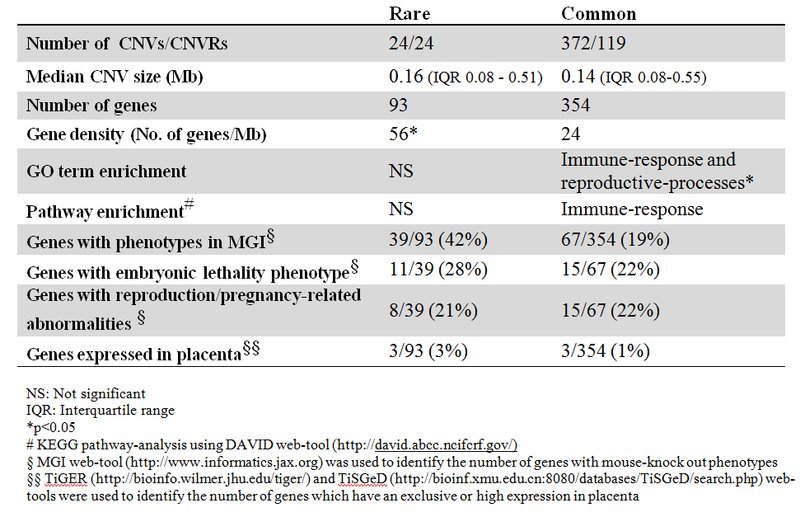 Also, higher percentage of genes in rare CNVs (~40%) was associated with disease in mouse models, suggesting the importance of their function in development in comparison to common CNV genes (~20%). But our study showed that common CNVs could also have a role in miscarriage as their genes were enriched in pregnancy/reproduction related and immune-response biological pathways which are essential for a healthy pregnancy. Disruption of these pathways due to a CNV, could lead to miscarriage. Therefore, our study concludes that both rare and common CNVs could play a role in at least a subset of early miscarriages. However, to increase our knowledge about the importance of CNVs in pregnancy and reproduction, it is necessary to study more miscarriage cases to have a large pool of miscarriage CNVs for analysis. We have created a database that catalogues all miscarriage CNVs, as well as those detected in the couples, aiming to facilitate a more meaningful and collaborative effort of finding the cause of miscarriage. Genomic characteristics of miscarriage copy number variants. Bagheri H, Mercier E, Qiao Y, Stephenson MD, Rajcan-Separovic E.